Victoria Pasqual said she left a Dunkin’ Donuts parking lot for less than a minute to drop off her brother across the street. When she got back, her car had a boot on it. “I went to my car door [and] this man came up behind me and was like, ‘There’s a boot on your car,’ and I was, like, so nervous,” said Pasqual. This wasn’t a yellow boot from the city, but a boot from a private company by the name of Innovative Parking Solutions, or IPS. Private booting is not a new practice in Chicago – IPS has existed in some form in the city since 2002, according to state records – but it’s one that continues to be a source of tension for drivers, business owners and city aldermen. IPS, formally known as Global Parking Management, is the sole private booting company in Chicago. It is hired by business owners and property managers in 33 wards to ensure that drivers who park in private lots are rightfully patronizing those businesses. IPS employees sit in these private lots and boot vehicles that are left unattended. When the driver returns, they are faced with a $170 fine to have the boot removed – nearly three times the cost of a city parking ticket. In 2018, City Council overwhelmingly approved a 21-percent price hike, raising the fee from $140 to $170. While private booting is a maddening fact of city life for some drivers, IPS co-owner Michael DeNigris said it’s for the benefit of business owners and is a “softer approach” than city towing. But for some drivers, being booted can sour their opinions on those businesses altogether. “I wouldn’t, you know, patronize this restaurant and I would tell people to stay away,” said Marco Camacho, who was booted after leaving a Church’s Chicken parking lot in October. Since 2013, roughly 300 complaints have been filed with the city against Global Parking Management or Innovative Parking Solutions, according to a public records request made by DePaul University’s Center for Journalism Integrity & Excellence. The majority of complaints are from customers who admit to not realizing they might get booted. Twenty-five complaints involved drivers who said they were present at the time of booting and 13 in which the driver claimed to be legally visiting a business in the lot. As more and more complaints surfaced, some aldermen began to take action. Ald. Scott Waguespack, 32nd Ward, has been working with IPS since he assumed office in 2007. Waguespack implemented rules for the company to follow in his ward – such as clear warning signs, uniforms, identification and audio recordings of each interaction – and they have become standard regulations across the city. Graphic: Know your rights as a consumer. Now each private lot must have at least two signs that clearly state the booting policy, the fine and a 24-hour contact number. IPS attendants must wear identification badges and uniforms and a copy of the city’s Consumer Bill of Rights must be posted on the windshield of each booted vehicle. If a driver returns to their car while it’s being booted, the boot must be taken off at no cost to the driver. If a vehicle is occupied, it cannot be booted – even if one of the passengers leaves the lot. Even with these changes, there are still complaints from drivers. Some claim that these regulations are not always being followed, often at the driver’s expense. Camacho came back to his vehicle while it was being booted, but he still paid the fine to have the boot removed. He didn’t realize the boot should have been taken off for free until he read over the Consumer Bill of Rights. 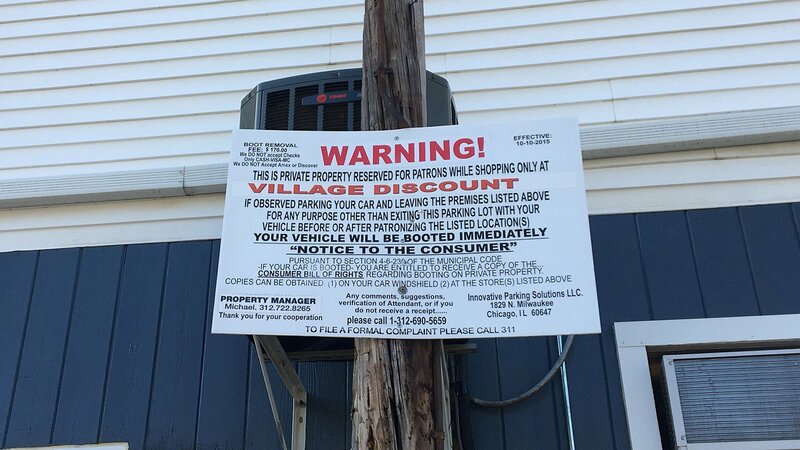 While property owners are the ones who let private booting companies operate in their lots, aldermen determine whether or not booting is allowed in their wards. When Waguespack assumed office in 2007, there were 10 active lots in his ward. Today, there are three. Getting booted can be a serious headache and financial burden for drivers – but for business owners paying upwards of $10,000 a month for rent and a parking lot, private booting might be the only option to ensure their lots are being used fairly. At the tail end of the reporting process, the Center for Journalism Integrity & Excellence discovered the case of Katie LeBeau. LeBeau was booted in a private lot at 1500 N. Damen Ave. even though she was legally patronizing a business there. She paid the fine and then filed a complaint with the city. LeBeau said IPS gave the city the wrong recording of their interaction and later refused to turn over the correct recording when confronted. A court suit was filed by the city and IPS was fined $1,000. If you believe you have been unfairly booted, file a formal complaint with the Chicago Department of Business Affairs and Consumer Protection. Reporting by Cody Corrall and DePaul’s Center for Journalism Integrity & Excellence. Note: This story will be updated with video.